Microsoft Or Cisco Network Exams: Which One You Should Go For? IT professionals skilled in the areas of networking are always highly demanded in today’s job market. If you are interested in starting a career in this field, you should consider one or more of the best-of-breed networking certifications. The network certifications give you an edge and set yourself apart from the competition. There are a lot of certifications that IT professionals must master especially those who aspire to work as network administrators. Let us find out which network certification is better, Microsoft or Cisco. Let us introduce you to the two networks and the differences between the two networks. A Microsoft network constitutes Server that is a specially configured computer designed to perform specific functions. Servers can keep track of the computers in its domain or workgroup, users, and their passwords. Cisco networks do not keep track of computers, but they keep track of the IP addresses that pass through them and redirect them to different routers. Cisco routers are very limited in function. The Cisco networks are not used for word processing, nor for graphics design. Routers allow traffic from one location to get to another location. Let us look at the requirements to become a network professional with the Microsoft or Cisco certifications. This is the highest certification that one can get from Microsoft. 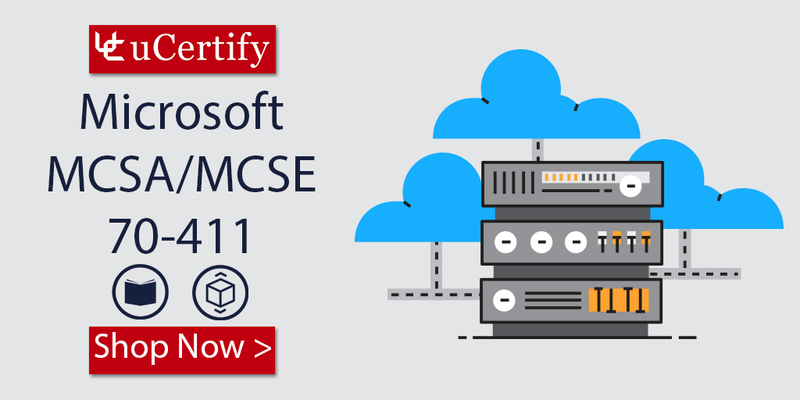 The Microsoft MCSE certification focuses on the skills such as installing client software or server software; manage and plan networks; troubleshooting network problems; design different network components. Cisco CCNA certification validates your understanding of making a point-to-point network, meeting users necessity by determining the network topology, routing protocols keeping in mind the end goal to connect network, and building network addresses, among different topics. 3. Which One Is Better Microsoft or Cisco? The main difference between the two is the type of work each demand. From a work perspective, the organizations working with the daily operations on the server will prefer Microsoft engineer over Cisco certified professional. The salary difference is also a remarkable thing for the professional. 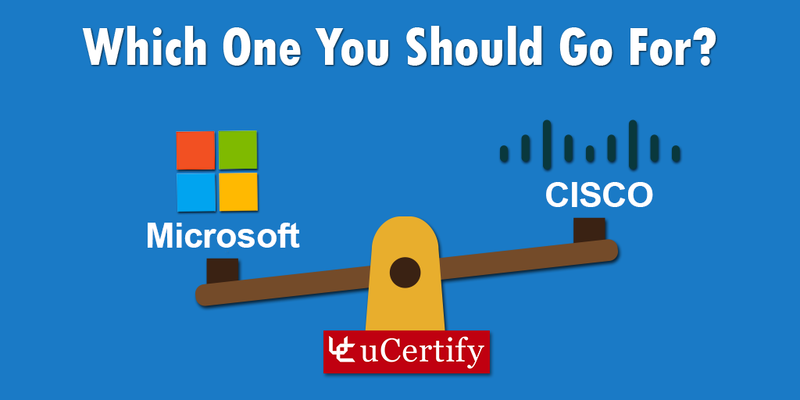 A Cisco engineer will earn lesser than a Microsoft certified engineer. This gap can be wider depending upon the skills. Finally, Cisco offers other certifications like the CCNP that will help you enhance your career prospects. Microsoft also has other certifications in its library, but the MCSE is their top Cert. We have given you the knowledge about all the differences between the two certifications. Both the Microsoft or Cisco certs have their advantages and drawbacks. Both the Microsoft or Cisco certifications offer career opportunities in the leading IT fields. You can enroll in the comprehensive course and performance-based labs offered at uCertify. The cert guides will help you prepare and pass the Microsoft or Cisco certification exams. Posted in CCNA, MCSE, Microsoft. Looking to pass the Microsoft 70-411 exam? You must search for an online learning platform that can teach you all the necessary concepts and skills needed for passing the cert exam. Preparing for this exam can be stressful and time-consuming, but it can be fun with the uCertify interactive study material that offers hands-on learning. We bring you the 70-411 Administering Windows Server 2012 R2 course and performance-based labs for the Microsoft 70-411 certification exam. Performance-based labs simulate real-world, hardware, software & command line interface environments and can be mapped to any text-book, course & training. The study guide provides complete coverage of the 70-411 exam objectives and provides knowledge and skills on the topics such as configuring file printer services and NPS; managing Active directory and group policy; deploying, managing, and maintaining servers, and many more. The MCSA/MCSE cert guide teaches you all the basic and advanced concepts of Windows Server 2012 R2 and develops skills required for passing the 70-411 exam. The MCSA/MCSE Windows Server 70-411 course contains live-labs as an add-on component to enhance learning experiences. Live-lab is a real computer equipment, networked together and conveniently accessible over the Internet using virtualization. The Administering Windows Server 2012 credit towards Microsoft MCSE and MCSA certifications. It is a required part of the MCSA certification and further can be upgraded to MCSE certification. The MCSA/MCSE Windows Server 70-411 certification is targeted at network or computer systems administrator or a computer support specialist. This exam tests the skills and knowledge necessary to administer a Windows Server 2012 infrastructure in an enterprise environment. Passing this exam validates a candidate’s ability to administer the tasks required to maintain a Windows Server 2012 infrastructure, such as user and group management, network access, and data security. So, start your prep for the MCSA/MCSE certification exam with the uCertify study guide and enhance your career prospects. As there are regular technology modifications, getting certified is the best method to differentiate yourself from other competing candidates and validate your skills in front of the hiring managers. As per Forbes survey this year, salary offered after getting this certification is USD 128,156. Certified Information Security Manager (CISM) certification is designed to validate management skills and focus on the correct application of security methods and system assessing policies. This certification validates your skills of international security methods and recognizes the professionals who manage designs, and oversees an organization’s information security. ISACA is the certification provider. More than 32,000 professionals have earned this certification in the year 2017. As per Forbes survey this year, the salary offered after getting this certification is USD 121,729. Certified Information System Security Professional (CISSP) certification is designed for individuals working for system security. This is a vendor-neutral certification and validates your expertise in the field of security. ISC2 is the certification provider. In 2017, there are 111,000 certified professionals worldwide, and two-thirds of them are from the USA. As per Forbes survey this year, the salary offered after getting this certification is USD 119,349. Project Management Professional certification is one of the most acknowledged project management certification given by the Project Management Institute. The certification is intended for the project managers working in the industries. This certification validates your expertise in the field of project management and helps in your career growth and salary increment. PMI is the certification provider. In 2017, there are 730,00 PMP certified professionals working in 210 countries worldwide. As per Forbes survey this year, the salary offered after getting this certification is USD 115,471. Certified Information Systems Auditor (CISA) certification is designed for professionals working in the field of auditing, monitoring, controlling. This certification validates your abilities to manage vulnerabilities and process controls, and updates to a company’s policies to make sure that they are according to standards. ISACA is the certification provider. There are 126,000 certified professionals in the year 2017. As per Forbes survey this year, the salary offered after getting this certification is USD 93,718. Microsoft Certified Solutions Expert (MCSE) – Windows Server 2012 certification is designed for administrators working in the field of storage management, configuring and managing high availability, group policy, and virtualization. The certification helps in the areas like configuring both the networks and Active Directory infrastructure and covers both Windows Server 2012 and Windows Server 2012 R2. Grab the attention of your dream employer with the IT certification courses provided by uCertify. So, what are you waiting for students! Get yourself enrolled in the uCertify courses and take your career to the next level. Posted in CISSP, IT certification, MCSE, Microsoft, PMP.